On top of my "movies to see" list this month is Les Misérables, a motion picture adaptation of one of my favorite books and musicals. 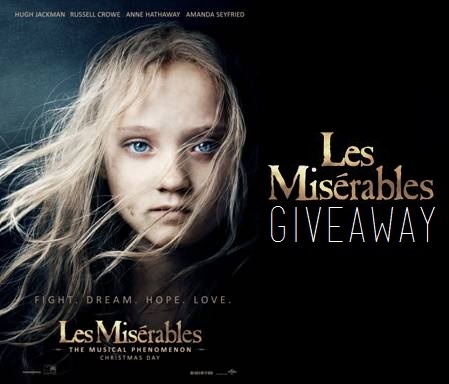 Les Misérables features Hugh Jackman, Russell Crowe, Anne Hathaway, Amanda Seyfried, Eddie Redmayne, Aaron Tveit, Samantha Barks, with Helena Bonham Carter and Sacha Baron Cohen. With such a talented cast and timeless storyline, it's definitely a must-see. If you're as excited as we are for the movie, you only have a few days left to wait. 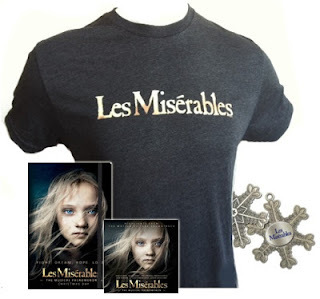 Les Misérables is in theaters on December 25, 2013! In the meantime, check out the official website, Facebook, and Twitter. I love Les Mis and am so excited for the movie! Can't wait to see the movie....it looks great! I like the song "On My Own". I entered on the rafflecopter as Mary Happymommy. Thanks! My favorite song is probably "I Dreamed a Dream". I CAN'T WAIT TO SEE THIS!! Love the book. Love the Broadway. Love that the world didn't end today. I dreamed a dream!!! love it! On My Own! It's a classic, and Eponine is my all time favorite character. My favorite song is "On my Own" Cannot wait for the movie! Castle in the Sky is definitely the best song on the soundtrack. Definitely "I dreamed a Dream." I lovelovelove I Dreamed a Dream!! !